Thanks to Pierre Moulon, now PPT include the Multithreaded matching of Pablo d'Angelo. The modified code is release in TheFrenchLeaf github page. I update the deb package of ArcheOS (ppt version = 0.5). The results are amazing, but you will notice it only if you have more then two CPUs. I will upload a 64bit Debian version as soon as possible, just check from time to time the related Arc-Team webpage. 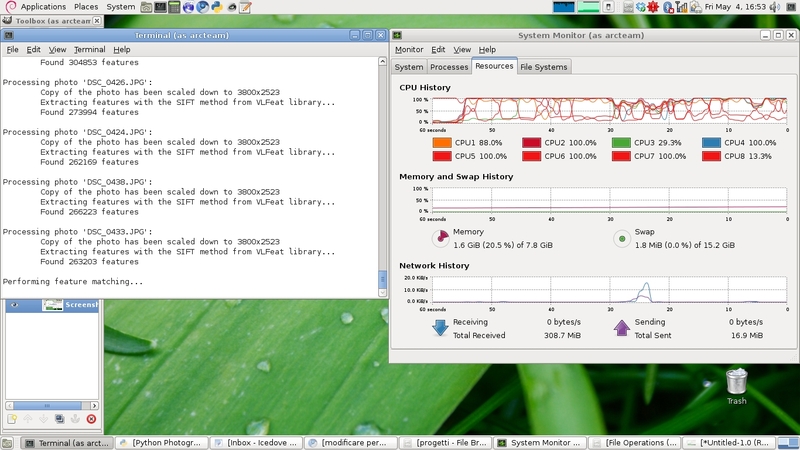 The picture below shows a 64bit machine with 8 CPUs working concurrently during Bundler. Great! This will decrease the time to render 4x here. Pierre is doing a great job! The new software is working very good.